Ok, one more Chewbacca post. 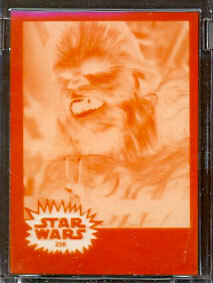 You can buy the 1977 Topps Star Wars 4-Color Film Positive #298 on ebay. There’s four days left in the auction and it’s up to $21.71 (ouch). When I saw this item, I was reminded of something that I completely forgot about when I was making all the previous Chewbacca posts. My family went to see Empire Strikes Back in the theater in 1980. I was 5 years old. I remember we sat very close to the screen because the theater was packed. Chewbacca scared the living daylights out of me.